Renowned magazines like Metal Hammer and Kerrang call you the “The UK’s next brightest metal hope”, your producer listens to the name Matt Hyde, on top of that you are signed by an enormous label like BMG and opened gigs for well-known names like Slipknot. Man those credentials lead to some serious expectations! Let us first start with what Raven’s Age brings on their debut, before we answer the question if they have met the expectations or not. They play a brand of modern rock/metal with sometimes an old fashioned edge, which is mainly caused by Michael Burrough his vocal style which is clean and has a story telling like cadence. In the mix his voice is put really in the forefront of the music as if all other musicians don’t play a big role in this band. This is normally not a big problem, when your singer is the ace of the band and has an extraordinary voice. Unfortunately this is not the case with Raven’s Age. Michael his voice is definitely not bad or terrible or anything along that line, but also not much more than average. Average vocals is something I can live with, when we hear some good and interesting performances out of the other musicians. Due to the fact that the other instruments are pushed back to give way to the vocals, it’s not easy to decipher what the level of the other musicians is. And that’s a shame! ‘Promised Land’ kicks in. The first impression of this song is very favourable, vocals sound interesting, nice build up and has a nice chorus and it finds its way into your head quite easily. Too bad it has a case of Metallicavitis, since after the 4 minute mark they should’ve cut the song. It overstays its welcome. 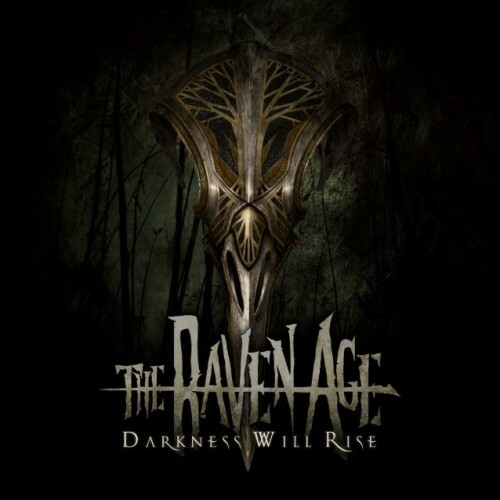 ‘Age Of The Raven’ is an excellent follow up and the small let down is easily forgotten. One thing though that already warranted some attention is that already the vocal lines seem eerily similar. Michael has an interesting and quite a unique voice in the genre, which could set them apart, but because of the use of the same vocal progression and a lack of dynamics in his voice and intonation, it misses some surprises which the album really needs. With ‘Salem’s Fate’ it seems that they have found a bottle of inspiration and variation, but unfortunately again rhythm and tempo is too similar to the above mentioned songs. This problem keeps repeating itself on this album, which makes it as a whole a very boring ride. Due to the need of reviewing it, I had to listen to it completely multiple times, but it was a real chore. The songs on themselves are quite okay and some even more than that, so in a vacuum the songs are fine and you hear that the guys are definitely capable musicians, but as a whole the album is just too repetitive. Perhaps I am quite harsh on this album, but if you are considered a new hope for metal and you are being produced by a top notch producer and clearly a huge record company has faith in you, the expectations are high and you are measured against it whether it is fair or not. It could also be the case that I am missing something and the penny hasn’t dropped for me, but I am just not nearly as positive as those two rock/metal institutions.